Just for clarification: I am only talking about the back end. A back end is the data access layer which manages requests comming to the server. It needs to server many requests (> 100 requests/second) fast (< 300 ms in average). It should not execute computationally heavy jobs which can be pre-computed or do not need to be displayed instantly to the client. This can be done by another system which does not need to be programmed in the same language. The back end does also not deal with presentation to the user. This is what the front end does. However, you should have more than a good idea in which form the front end gets the data. The cleanest approach I've seen so far is a pure RESTful API for all interactions between front end and back end. The backend language should also make it easy to validate / sanitize input data, connect with databases, store/get stuff on/from the file system. type problems: This is a bit fuzzy, as you can write stringly typed code (see New Programming Jargon) in probably every language, but in some languages it is more common than in others. Some languages also make it easier to use the type system to detect errors. For example, PHP is very insecure in this sense as 123 == "123ab", Python is a bit more secure, but you can return whatever you want, Java is much more secure. Haskell is even more secure in this sense, as it has real functions (without side effects, checked by the compiler). See What can Haskell's type system do that Java's can't and vice versa? for more. There are also some errors which can be detected at runtime. The handling of those runtime errors differs from language to language. For example, C and C++ fails silently (e.g. this question). This is bad. For example, there are some silent out-of-bounds errors in C / C++ where Rust would fail loud (I think Heartbleed is one example; see Would Rust have prevented Heartbleed? Another look if you're interested in that specific example). Of course, all of those problems can be detected with good testing. But the more is done automatically, the less can go wrong when you don't write (good) tests. Java is an object-oriented language which runs on the Java Virtual Machine. Java is probably the most used language for big business websites. Why is that the case? Java is old: It first appeared in 1995. Java is taught at many universities and many people know at least a little bit of Java. So companies don't have problems finding developers. At least that might be the impression of people who don't realize that there is a big differencee between people saying they know Java and developers who can actually work with it. Java is developed by Oracle. Hence you can make contracts with Oracle to get support when things don't work. That was what we have on the positive side. What is not so good about Java? VERY clumsy syntax. This is more than just a inconvenience. You have to type a lot to get things done which makes you slow. Of course, you can (and need to) use autocompletion, but it is still a lot to read. That makes maintaining the code a mess. Tools are hard to get to work. Unnecessary super-abstract constructs used for eventually never happening future extensions (see Geek-and-poke.com). A bit more secure than C/C++ as you cannot access out-of-bound arrays, you don't have pointers. So buffer overflows are almost impossible in Java (see SO for more details). However, you buy this security with much less easy syntax and you don't get as much security as would be possible with just a bit more effort. See rust for more details. Why do I hear about so many Java insecurities? Are other languages more secure? : The short answer is no, thinking about C/C++. The syntax is flexible and light-weight. Backbone.js / AngularJS for MVP / MVC. Grunt as a task runner. What is still to say? Go is a statically-typed, compiled language developed by Google. It first appeared in 2009, so it is very young. Some tasks are much more complicated than they should be. Sorting, to name one example (see SO). Go is different from some other languages, e.g. if you want a method to be public, the first character of the method name has to be capitalized. Or unused variables result in a compiler error. C# is a compiled, statically typed language (with dynamic features, see Understanding the Dynamic Keyword in C# 4) developed by Microsoft. It was publically announced in 2000. The initial release of its web appliction framework ASP.NET was in 2002. But I don't know enough about C# / ASP.NET to write something meaningful about it. Coding Horror described why they use ASP.NET for StackOverflow and why he doesn't recommend it for OpenSource projects (source). StackExchange also describes what they use (1, 2). I see a big problem in the Microsoft-centric technology stack. You have to use everything from them. (Almost) everything is closed source. If they discontinue the development or if they don't fix stuff which might be relevant for you, you're fucked. This seems to change. Microsoft moved some important parts of their stack to GitHub (see dotnet.github.io). Most important seems to be that the compiler Roslyn is licensed under an Apache License. But there is also ASP.NET, the Entity Framework, and the .NET runtime. The Visual Studio Community Edition is not available for free (but only for Windows). Python is one of the oldest programming languages which are still in use. It first appeared in 1991. Python is dynamically typed, interpreted, object-oriented and includes functional programming features. Although I use Python for many projects, I didn't use it by now for a web project. So I might not know the important tools / frameworks. Please keep that in mind. Sphinx: (Semi) automatic code documentation, e.g. the scipy docs are generated with Sphinx from Python code. This is one of the best documentations I have ever seen. Flask and Django work with PyPy (source). That might make them much faster. I think one of the main advantages of Python is that it is really easy to write code which is easy to read (because of docstrings, Pythons weird intendation semantics and very nice syntax) and quite hard to write unreadable code. 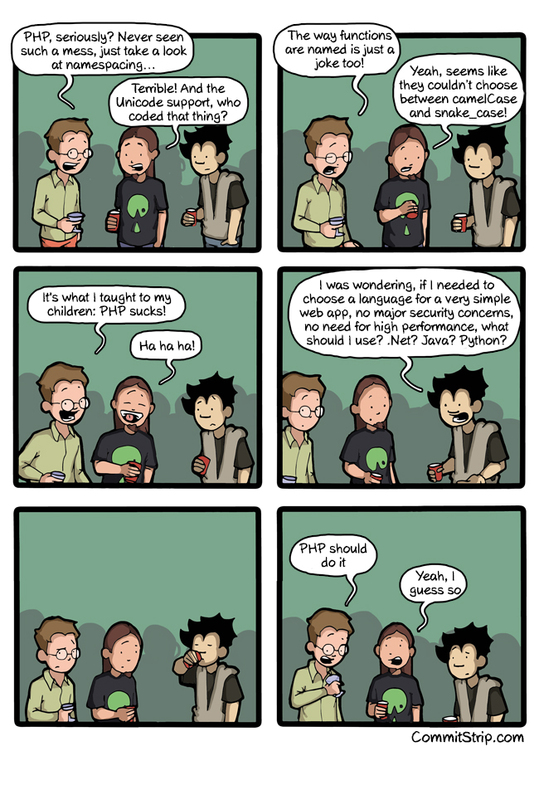 I am sure I have a biased view regarding Python, but I am also sure a lot of people share this subjective impression. PHP is a server-side scripting language which appeared first in 1995. It is dynamically typed. A big advantage of PHP is that it is easy to learn. You can run PHP everywhere and hosting is cheap. Wikipedia makes use of PHP, so it is obviously possible to create systems which have HUGE numbers of requests and still work fine. Function arguments and return values can be annotated with types. Rust is a very safe language, but seems not to be ready for productive usage. I am a big fan of Rust, but as it aims to be a better C++, it is probably a better fit for OS development, game engines, embedded systems, databases, complex desktop applications (Photoshop/Word/Chrome), etc. While Rust is quite expressive for a systems programming language, its banner features are the borrow checker (+ lifetimes, etc) and powerful static type system. Rust emphasizes zero-cost abstractions with compiler-enforced memory & thread safety. The popular web development languages are dynamically typed and interpreted, with an emphasis on rapid development, which is a very different niche than Rust claims to fill. Ruby with Rails: I know it is quite well-known and used by many people. But I don't know Ruby enough to write anything meaningful. The Ruby syntax is similar to Python. Python: It is the language I know best and of which I like the syntax best. Besides that, it has a very nice and clear syntax, good community-developed coding style standards and is very easy to read and well-documented. C#: The technology stack is too Microsoft centered. Java: Too clumsy syntax, too hard to get it work. The other programming languages could be very good choices. I simply don't know it. I am very curious if rust will be used for back ends. Hack is very young, let's see if it will spread in a few years. Sören Liebich (@liebsoer) has several years of experience with Java web development and helped me to name the important tools / technologies used in the Java stack. Henning Dieterichs helped me to fix some of the mistakes in the C# part and reminded me of Hack and the positive sides of PHP. Stefan had a look at the PHP section.